The Maccabees: the festival today* is indeed in their honor, though not many recognize them because their martyrdom antedates Christ. ** Yet they deserve universal recognition for their unswerving devotion to the ways of their fathers. Consider what they, whose martyrdom preceded Christ's passion, would have achieved if they had been persecuted after the time of Christ and were able to emulate his death on our behalf. If they were able to display valor of this magnitude without the benefit of such a model, how could they not have gained in heroic stature had they undertaken their trial with the example of Christ before them? Not one of those who attained perfection before the coming of Christ accomplished his goal without faith in Christ. While this statement is both arcane and even to a certain extent mystic, I for one consider it very persuasive, as do all who love Christ. For although the Logos was openly proclaimed in his own era, he was made known even before to the pure of mind, as is evident from the large number of persons who achieved honor before this day. * Delivered December 362 in Nazianzus. ** Although the Maccabean martyrs were known and cited by early Christian writers along with other Old Testament figures such as Daniel, they do not appear to have been singled out for special veneration prior to this sermon. *** Gregory is referring to 4 Maccabees, formerly known under the title On the Supremacy of Reason and ascribed to Josephus, which elaborates on the story told in 2 Macc. 6:18-7:42. **** 4 Macc. 1:7-8. 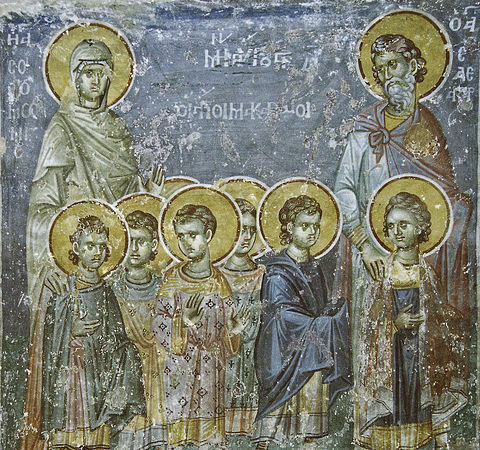 These examples include Moses, Joseph, Jacob, David, Daniel, and the Three Children. From Oration 15, "In Praise of the Maccabees", PG 35.912A-33A.